This CD features works by Finnish composer Aarre Merikanto. 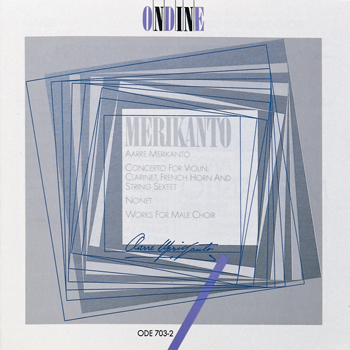 The original LP release from 1986, the third in Ondine's history, contained only the Concerto and the Nonet, both recorded at the Kuhmo Chamber Music Festival in 1984. Violinist Oleg Kagan, clarinetist Eduardo Brunner and hornist David Jolley are the soloists in the Concerto. Ulf Söderblom conducts the Kuhmo Chamber Ensemble. The eight works for male choir, featuring the Polytech Choir under Tapani Länsiö, were recorded at the German Church in Helsinki in 1987.